On a Monday evening recently, Christ Church Spitalfields was alive to the sound of a big band playing show tunes. 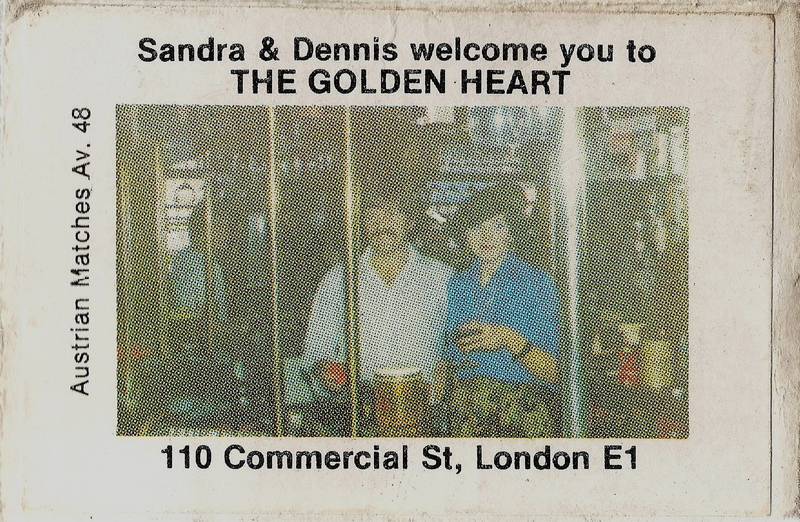 It was the night of the memorial arranged by Sandra Esqulant, landlady of The Golden Heart in Commercial St, to commemorate the life of her husband Dennis. They ran the pub together for over thirty years until he died a year ago. Sandra and Dennis’ friends and family were all present to pay tribute, supported by many residents of Spitalfields and, as I sat in the church while everyone was taking their seats, I wondered if there was anywhere else in London where the entire community would turn out in this way to celebrate their beloved publican. Tracey Emin was the first to stand up and speak, affectionately recalling the first time she met Dennis, when he rescued her from the attentions of an unwanted admirer who mistook her for a prostitute. Expressing a sentiment shared by the majority in Spitalfields, Tracey closed her tribute with a declaration of the love commonly felt for Sandra among the populace here, who look to her as a community figurehead and inspiration. Kerry Phillips, one of Dennis’ contemporaries from his time working at the Truman Brewery, fondly recalled shared family holidays and confirmed Tracey’s story, describing Dennis’ ability to grab troublemakers by the scruff of the neck and eject them from the bar without even a break in the conversation. Then Stephen Craig spoke of running the marathon to raise £12,500 for the Dennis Esqulant Lung Foundation and a surgeon from St Bart’s collected the cheque on behalf of the cancer clinic, which drew emotional applause from the congregation. True to Dennis’ reputation as a magnanimous host, the event concluded with drinks served in the church as the band played and guests mingled by candlelight beneath Hawksmoor’s awe-inspiring ceiling. It was the perfect culmination to a contemplative evening as both the volume and our collective spirits rose under the influence of a few glasses. 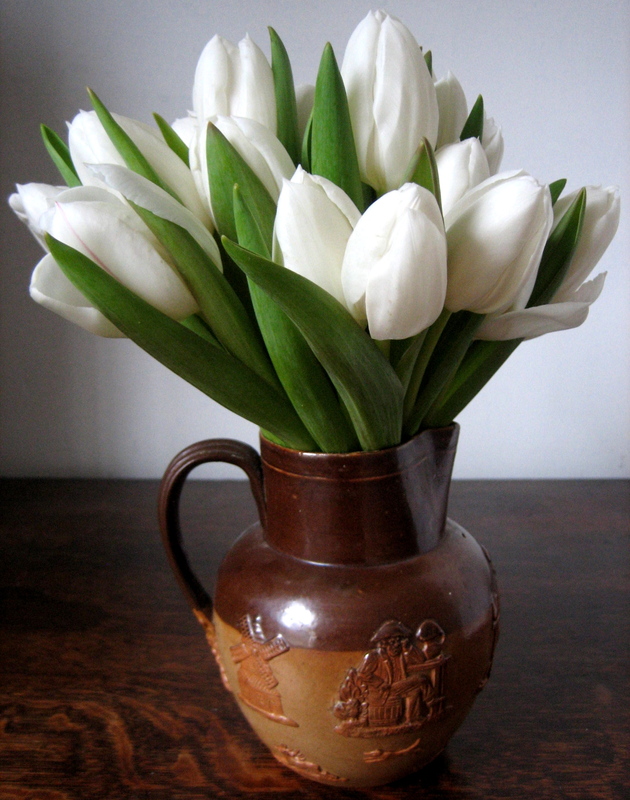 And when the time came to leave, in a spontaneous gesture, Sandra distributed bunches of the vast number of white tulips that decorated the church to guests as they departed. Walking home through the dark streets with my tulips in hand, I realised the tribute had been conceived with a great deal of care and passed off with a relaxed professionalism that was entirely characteristic of Sandra. Over the year since Dennis died, Sandra has worn black as an expression of her mourning and everyone in Spitalfields has empathised with the depth of her grief, because over all these years we have grown used to her as our inspired mistress of ceremonies at The Golden Heart. Until this year, we thought of Sandra as the woman who knew better than anyone else how to throw a party and who could always be relied upon to crack open an unexpected bottle of champagne on cue. Consequently, while we share her loss, we have been doubly saddened to see her brought down. We cherish Sandra for her hula-hoop dancing on the traffic island in the middle of Commercial St and for returning to the pub after an event in the West End with Elton John’s backing dancers in tow, to dance upon the bar in full costume at her invitation. It was a week after Dennis’ memorial when I went round to The Golden Heart late one afternoon to have a quiet chat with Sandra at the fireside in the back bar before the evening’s trade got underway. “Me and my family are especially grateful to the Sisters of Charity and Father Tom of St Mary & St Michael who have given us so much support.” Sandra told me, describing the solace she has received from the counsel of those at the church in Commercial Rd where she and Dennis were married. “Dennis worked in the brewery and understood the brewing process. He knew everything, particularly about his bitter. Fundamentally, it was one big family, the draymen to the company directors used to drink in here.” she recalled warmly, indicating the direction of the Truman Brewery that closed in 1989. “When we were first married we used to open at six in the morning for the market.” she added, with a glance in the direction of the Spitalfields Fruit and Vegetable Market that closed in 1991. During the lean years following these closures, it was Gilbert & George who were the first artists to bring their patronage to The Golden Heart, thereby initiating the new identity for the pub that it enjoys today, as a magnet for young artists to whom Sandra graciously extends her maternal affection. Turning her gaze back to the fire, Sandra’s thoughts returned to Dennis, still troubled by the cancer that afflicted him, “I protected him from so much but I couldn’t protect him from that. It’s heartbreaking to see someone you love go like that. Where does this disease come from? I don’t know.” After a silence, she raised her eyes to mine,“We had so many fabulous times in the past, not many people have that.” she said, reminding herself of the salient truths,“I brought up our three children here and they turned out all right.” Then, as if on cue, Sandra’s daughter Kate appeared, she had been watching the bar during our conversation, and has shown dignified resilience through this whole episode. It cannot be easy leading your life in public and with the relentless imperative to open every day, but Sandra’s answer to this challenge is simple,“I work very hard because I love people.” she said plainly. Then our brief conversation was necessarily at an end because she had to go upstairs and make steak pie for her dinner, a modest notion which nevertheless appeared to fill Sandra with an enthusiasm and delight, indicative of the spiritual consolation of familiar meals. A few days later, I was back at The Golden Heart to celebrate an art opening and as she came round to our table collecting glasses, Sandra’s eye fell upon a collapsible top hat belonging to a friend of mine. She could not restrain herself from taking the silk topper in hand and causing it to spring back into shape in an instant, with the necessary flick of the wrist and a sophisticated grin worthy of Liza Minelli. In this playful act, itself a tiny moment of happiness, I realised something had changed now and I had been granted a glimpse of the old Sandra we have all missed so much. I am sorry to hear that Dennis passed away I lost my mother the same way. I used to live in Spitafields from 2000 until late 2007 and as you mentioned Sandra always looked after her regulars, and welcomed newcomers to the area with equal warmth and affection. My fondest memories of Dennis where he would always stand the other side of the bar talking to to his customers, running a bar in the east end would never an easy job,but run it he and sandra did,next morning Dennis was up early walking the dog,or reading the paper and having an early morning expresso,dressed up to the nines. Dear Sandra , I met you and Dennis in 1980, when, you both, entrusted me your lovely children: Ryan, Sarah and Katie. I very often had thought of you all, and thought also to that short nice period passed in your house. And now I hear that Dennis is no more between us. This hurts so much and I am very, very sorry.